ONLINE PRE-REGISTRATION IS NOW CLOSED FOR ALL CAMPS. Welcome to Coach Mo Football Camps! Coach Montgomery and staff are hosting football camps this summer that will offer the opportunity for participants to work on fundamental and specialized skills of football. Our camps strive hard to accommodate individual needs so participants leave with a better understanding of the game and drills that will better enhance their abilities. Come visit us this summer to meet the ECU Football Coaching Staff and train with the best! 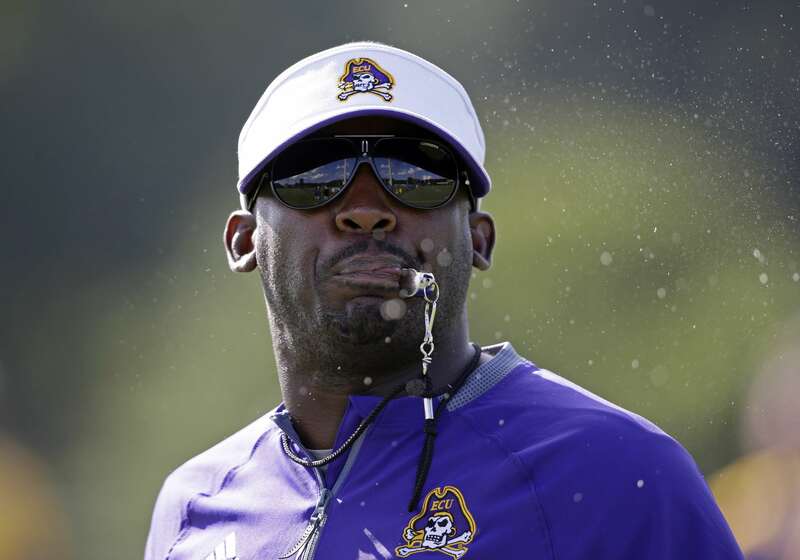 Scottie Montgomery, who has played an integral role leading Duke and the Pittsburgh Steelers to divisional championships and postseason play, is in his first season as head football coach at East Carolina University. The 2015 campaign marked Montgomery's second as both primary offensive play-caller and quarterbacks coach at Duke, a program in which he starred as an All-Atlantic Coast Conference wide receiver from 1996 to 1999. Montgomery's name is etched into the Duke record book for longest plays with an 88-yard pass from Bobby Campbell against Vanderbilt in 1998 and a 99-yard kickoff return versus Wake Forest in 1999. Montgomery was recently recognized for his efforts as a one of three finalists for the American Football Coaches Association (AFCA) National Assistant Coach-of-the-Year Award. Check out ECU Football on Social Media!